Well, of course, it’s just a joke. Nevertheless, Harmony of the Seas is not the first cruise ship that became known in such an unusual role. Today we’d like to recall several of them. Let’s go! First, a brief remark on the list of “ships-celebrities:” actually, a lot of movies in various genres were filmed on the cruise liners in the history of the cruise industry. With your permission, we’d like to remember funny, cheerful, nice – well, you know, that type of movies, which create positive impressions and make you dreaming of the next voyage. We invite you to check 7 movies on cruise ships that you should watch before your cruise. Love on a cruise – what can be more romantic? “An Affair to Remember,” an American romance film, came out in 1957. Today, more than a half century after, it’s still one of the best love stories ever. We bet Cunard’s beautiful Queen Mary has played a significant role in this. “The Diamond Arm,” the Soviet cult comedy, was released in 1969. It’s deservedly considered one of the greatest films of all times. One of the most famous scenes of “The Diamond Arm” was filmed on the legendary cruise ship Pobeda (built initially as Magdalena and then renamed Iberia), and we offer you to watch it together. In 1997, Holland America Line’s MS Westerdam (today known as MS Marella Dream chartered by Marella Cruises) became the main location of the brightest dances and funniest situations at sea. “Out to Sea” romantic comedy is about friendship, love, and cruises, of course. Each film starring Adam Sandler is cool. Each film starring Adams Sandler in a dual role is twice as cool. Especially, when the events take place on RCI’s Allure of the Seas. Well, of course, we are talking about “Jack and Jill,” 2011 comedy film. We offer you to watch not a trailer but something much more interesting – a story about how the scenes on the cruise liner were filmed. 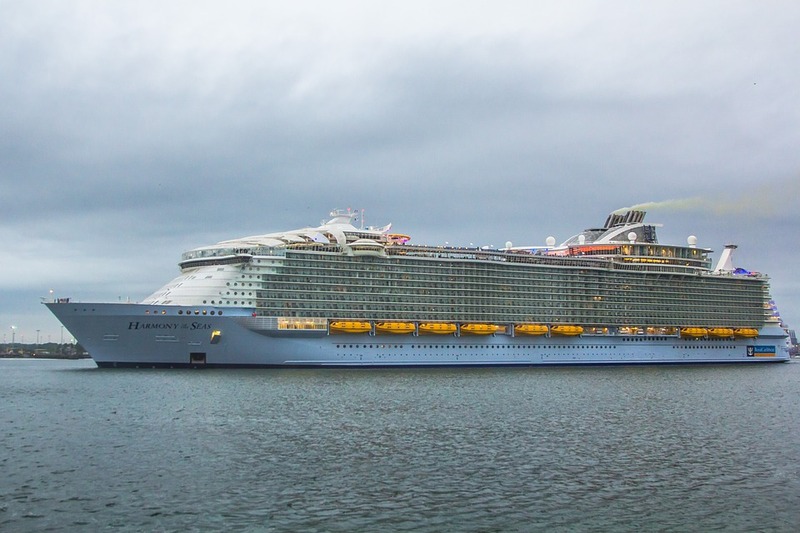 As we already mentioned at the beginning of this article, “Like Father” dramedy starring Harmony of the Seas was released on August 3, 2018. By the way, this film is a proof of the fact that a cruise is an excellent option for the family vacation (you can find reasons to set sail with your nearest and dearest here). “Love at Sea” is a Hallmark’s television film which shows not only life on the cruise for holiday-makers but also life on the cruise ship for the crew, and it looks fantastic. By the way, we are not surprised by the fact that Harmony of the Seas is an in-demand actress today. She looks impressive from any angle, and her participation in the filming is definitely the key to success. You can enjoy several exciting aerial videos of the liner via this link. Of course, this is just a small part of all great movies on cruise ships. Besides, many liners became heroines of TV shows, soap operas, documentaries, etc. However, we’ll continue to talk about cruise ships-superstars in the next article so stay tuned. By the way, we already discussed another unusual way to use cruise ships. You can read about this here. What are your favorite movies set on cruise ships? Please share your thoughts in the comments.